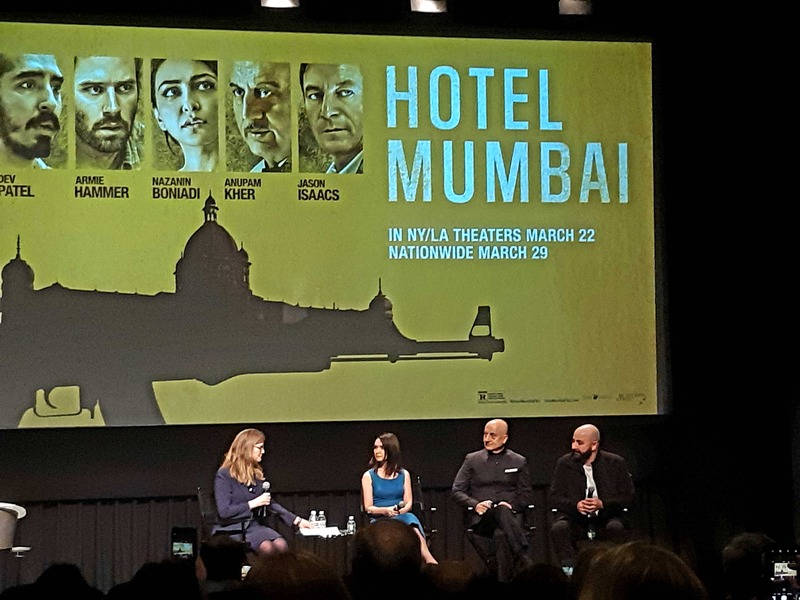 Maras, who sat down for a talk and discussion, and took questions from the audience – along with cast members from ‘Hotel Mumbai’, Anupam Kher and Nazanin Boniadi, after a private reception and screening of the film by the Council on Foreign Relations, at the NYIT auditorium, in New York, on Monday, the outstanding feature was the resilience and fortitude of the staff of the Taj, who showed immense bravery in helping some guests escape death. The film was shot mostly in Mumbai, but several smaller interior scenes were shot in Adelaide, Australia, Maras’s hometown. “Australia was a good place to incubate the 14 production, where we had everyone in a very controlled environment for hotel-room setups, so that the crew and cast could get to know one another. By the time we got to India to do the bulk of the production, it was a well-oiled machine, we knew where we were at and everyone had confidence in the project,” Maras said of the shooting of the film, in earlier interviews. On location in Mumbai, several scenes were filmed at the real-life sites where the events occurred. The train station that was attacked was filmed at the actual CST station. In the film’s opening scene, the gunmen arrive by boat at the same beachside fishing village the real-life perpetrators landed at in 2008. “Some of the fishmongers who live in that fishing village saw us filming and were taken aback, because our actors were dressed as the real gunmen were,” he said. The film also features real exterior shots of the Taj, plus newsreel footage from 2008. Maras cites the large front lobby of the Taj, where much of the terrorist shooting and bombing in the film takes place. “That was shot at this huge property just outside of Mumbai. We knew we were going to keep returning to that lobby over the course of the film. So, for example, you see a big bouquet of flowers in all its glory at the start, untouched, in the center of the lobby. And when it’s knocked over, it becomes a visual marker to help orientate the audience. That’s our production designer Steven Jones-Evans being really great and clever and smart,” he explained. “All of the kitchen interiors and the bowels of the hotel, meaning all the corridors and stuff that people run down, they were all shot in a five-star hotel in Mumbai that has since closed. We dressed it and filmed in there. A huge part of my wanting to shoot this stuff in India, apart from the obvious reasons of location, was also we wanted to be able to hire people from Mumbai to be extras, so again, that adds a level of authenticity,” he said. Maras also devised to have large speakers present on the locations, with the sudden, terrifying sound of gunfire blasting as the actors were working. Kher, for whom ‘Hotel Mumbai’ was his 501st film – apart from over 100 plays he’s done on stage, the film was a hard choice to commit to do. “When Anthony came up to me and said he was making a film on this, my first reaction was apprehension, to be very honest. It was too close to heart. We had witnessed the 72 hours of horrific drama, 24 hours a day, and this was happening like reality TV, except that the blood was real and victims were real,” Kher said, speaking at the NYIT auditorium. Portraying the character of the hero of the film, Chef Oberoi, from the Taj, was also hard for the horrific drama that had played out in real life, Kher confided. “Anthony’s passion was amazingly infectious, about making this film. When actors play real life characters they want to meet them, and find out who they are, how they sit, how they behave. But this was not something I wanted to do, and be insensitive about it. Can you tell me what happened?” Kher said of playing the role of a man whom he knew also from real life on his visits to the Taj. 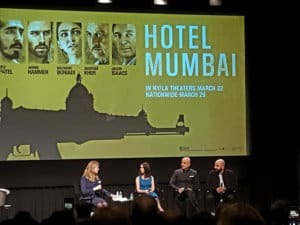 Kher revealed that the real life Chef Oberoi, who attended the film’s premiere at the Toronto International Film Festival, got a “never ending standing ovation which he deserved”. Kher himself stood on stage with him, in tears. “At the end, he said thank you to me. And that thank you is more than any other award I will ever get,” said Kher. Boniady said at the Monday meet, the resilience shown by the people inside the Taj those three days was a testament to the courage of not only the staff, but also the guests there. “It serves to me as a microcosm of the greater world. And you had people from all over the world. From different religions, ethnicities, languages, when they were faced with this horror. What really struck me is the unity, and the people banding together to survive,” Boniadi added.